Regicides Carcases to be taken up. Exceptions in Act of Grace. ORDERED, That the Report from the Committee, to whom the Bill for enabling Mr. Milward to sell Lands for Payment of Debts, is referred, be read Tomorrow Morning. Mr. Crowch reports Amendments to the Bill for enabling Sir Edward Gostwicke to sell Lands for Payment of Debts, and raising Portions for younger Children: Which he first read, with the Coherence, in his Place; and were afterwards read the First and Second time by the Clerk. Ordered, That the Word "Baronet" be inserted in the 19th Line of the Amendment, Page 8, in the Place of "Knight;" and the same, so amended, were, upon the Question, agreed. A Proviso was tendered to this Bill; viz. "Provided that the said Sir Rowland Litton, Sir William Beecher, Serjeant Keeling, and George Blundell, be not from henceforth, in any Sort, accountable or chargeable for or in respect of any thing which the said Sir William Litton hath done in the ordering or managing of the said Estate; for any Disbursements which he hath made concerning the same; or for any Articles or Agreements which he hath made to any Person or Persons, concerning the said Estate:" Which was read the First and Second time; and, on the Question, agreed; and ordered to be part of the Bill. Resolved, That this Bill, with the said Amendments and Proviso, be ingrossed. Mr. Swinfen reports from the Committee, to whom the Bill for enabling William Milward Esquire to sell Lands for Payment of Debts, was referred, that the Committee, upon View of the Bill, and Consideration of the former Security for the Monies therein mentioned, thought fit to report the same back without any Amendments. Resolved, That the said Bill be ingrossed. The Lords have sent down a Bill, intituled, An Act for the more speedy and ready Way of dressing and tanning all Sorts of Leather: To which they desire the Concurrence of this House. Ordered, That this Bill be read To-morrow Morning. Ordered, That a Committee be appointed to consider what publick Bills, sent formerly from this House, do now depend before the House of Peers, unpassed; and what may be fit to be offered to the Lords, at the Bar of their House, as Inducements to the speedy passing thereof: And that Sir John Northcot, Mr. Prynn, Sir Walter Erle, Sir John Bowyer, Sir Wm. Lewes, Colonel King, Mr. Bampfeild, Mr. Crowch, or any Three of them, be the said Committee: And they are to make Report To-morrow Morning. Mr. Thomas reports from the Committee, Amendments and Three Provisoes to the Bill of Attainder: Which he read in his Place; and were afterwards read the First and Second time by the Clerk. The humble Petition of Edmond Challenor Esquire, was this Day read. Ordered, That it be referred to Mr. Ratcliffe, to prepare, and tender to the Bill of Attainder, a Proviso upon the Sense of the present Debate. The Lords have sent you a Bill for settling the Manors of Knowle, Seale, and Kempsing, upon the Earl of Dorset, and his Heirs; and charging the Manor of Bexhill, and the Manor or Farm of Cowding, and other Lands, in the County of Sussex, with a Rent Charge of One hundred and Thirty Pounds per Annum, in lieu thereof: To which they desire the Concurrence of this House. The Amendments and Provisoes reported this Day from the Committee for the Bill of Attainder, were, on the Question, agreed. Resolved, That the said Bill, with the said Amendments and Provisoes, be ingrossed. Resolved, That the Carcases of Oliver Cromwell, Henry Ireton, John Bradshaw, and Thomas Pride, whether buried in Westminster Abbey, or elsewhere, be, with all Expedition, taken up, and drawn upon a Hurdle to Tiburne, and there hanged up in their Coffins for some time; and after that buried under the said Gallows: And that James Norfolke Esquire, Serjeant at Arms attending the House of Commons, do take care that this Order be put in effectual Execution. Ordered, That the Lords Concurrence herein be desired: And Mr. Tytus is to carry it to the Lords. The Lords have sent you these several Bills; and desire the Concurrence of this House to them; viz. An Act prohibiting the planting of Tobacco in the Kingdom of England. 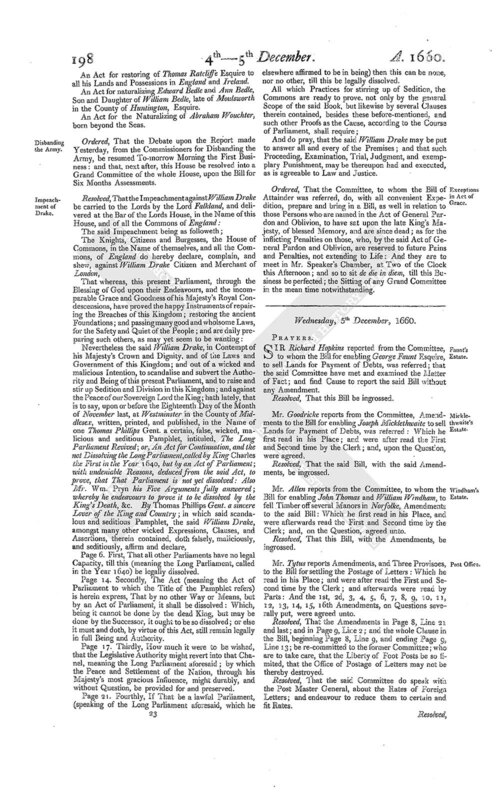 An Act for restoring of Thomas Ratcliffe Esquire to all his Lands and Possessions in England and Ireland. 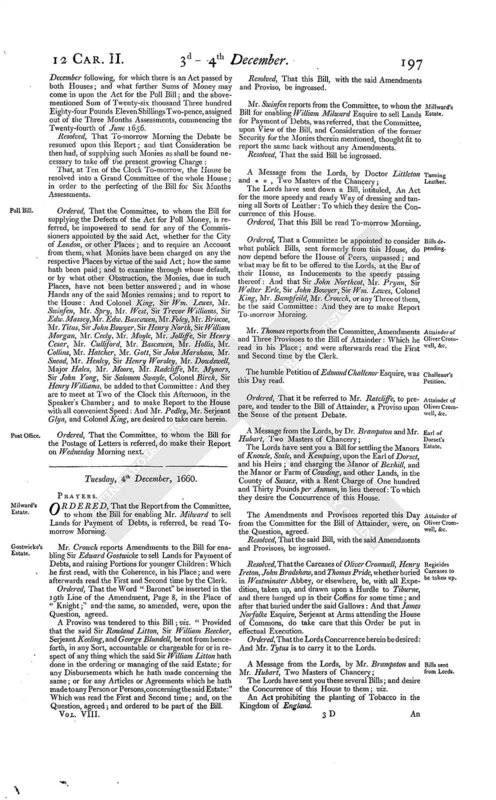 An Act for naturalizing Edward Bedle and Ann Bedle, Son and Daughter of William Bedle, late of Moulsworth in the County of Huntington, Esquire. An Act for the Naturalizing of Abraham Wouchter, born beyond the Seas. Ordered, That the Debate upon the Report made Yesterday, from the Commissioners for Disbanding the Army, be resumed To-morrow Morning the First Business: and that, next after, this House be resolved into a Grand Committee of the whole House, upon the Bill for Six Months Assessments. Page 6. First, That all other Parliaments have no legal Capacity, till this (meaning the Long Parliament, called in the Year 1640) be legally dissolved. Page 14. Secondly, The Act (meaning the Act of Parliament to which the Title of the Pamphlet refers) is herein express, That by no other Way or Means, but by an Act of Parliament, it shall be dissolved: Which, being it cannot be done by the dead King, but may be done by the Successor, it ought to be so dissolved; or else it must and doth, by virtue of this Act, still remain legally in full Being and Authority. Page 17. Thirdly, How much it were to be wished, that the Legislative Authority might revert into that Chanel, meaning the Long Parliament aforesaid; by which the Peace and Settlement of the Nation, through his Majesty's most gracious Influence, might durably, and without Question, be provided for and preserved. Page 21. Fourthly, If That be a lawful Parliament, (speaking of the Long Parliament aforesaid, which he elsewhere affirmed to be in being) then this can be none, nor no other, till this be legally dissolved. And do pray, that the said William Drake may be put to answer all and every of the Premises; and that such Proceeding, Examination, Trial, Judgment, and exempplary Punishment, may be thereupon had and executed, as is agreeable to Law and Justice. Ordered, That the Committee, to whom the Bill of Attainder was referred, do, with all convenient Expedition, prepare and bring in a Bill, as well in relation to those Persons who are named in the Act of General Pardon and Oblivion, to have sat upon the late King's Majesty, of blessed Memory, and are since dead; as for the inflicting Penalties on those, who, by the said Act of General Pardon and Oblivion, are reserved to future Pains and Penalties, not extending to Life: And they are to meet in Mr. Speaker's Chamber, at Two of the Clock this Afternoon; and so to sit de die in diem, till this Business be perfected; the Sitting of any Grand Committee in the mean time notwithstanding.